If you’re a graduate of Cristo Rey in Kansas City, you can be sure Sister Linda Ross has her eye on you. As the alumni director at the high school, she helps low-income students transition to and stay in college. 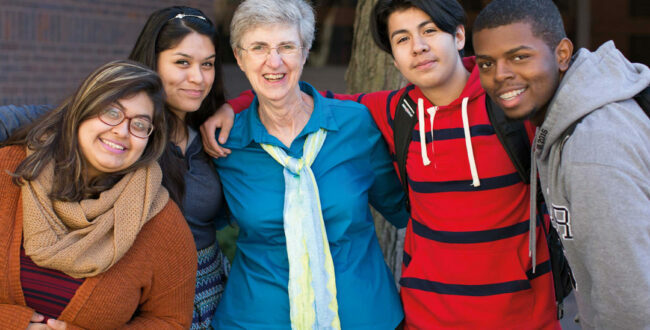 She has a big job: In Cristo Rey’s first 10 years, 100 percent of graduates have gone to college, which means Sister Linda is tracking and supporting nearly 400 alumni. Her flock faces enormous challenges: homelessness, cash shortages for books and meals, and remedial classes that can stretch a two-year program to a frustrating three-and-a-half years. These problems can derail even the most motivated students, which is why, nationwide, fewer than 20 percent of low-income students who start college actually complete a degree. Besides advice and support, the alumni program offers emergency cash assistance and help finding and keeping scholarships. It works. Nearly 63 percent of Cristo Rey’s alumni have graduated college or are in school now. Sister Linda isn’t quite satisfied. “Sixty-three percent is not as high as I’d like it to be. We want 100 percent,” she says.